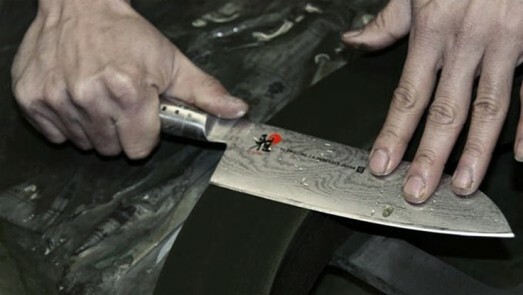 Discover more about the uses, sharpening, steel and the production of MIYABI knives. Only maintain and sharpen MIYABI knives with professional tools due to the hardness of the steel and the fine Honbazuke honing of the cutting edge. Take care to use the right tool as well as the correct technique. 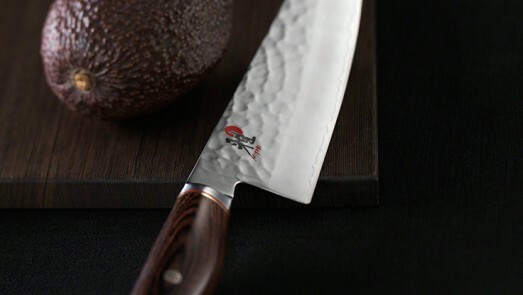 THIS TRADITIONAL JAPANESE HONING GIVES EVERY BLADE ITS INCOMPARABLE SHARPNESS. Honbazuke honing originates from traditional Japanese knife production. Every blade is sharpened and polished by hand in three stages in a complex process. 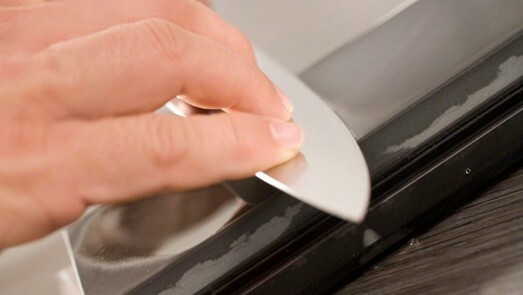 The blade is first coarsely ground using a vertically rotating sharpening stone, followed by a fine honing using a horizontally rotating sharpening stone. The edge is then polished using a leather stropping block for scalpel-like sharpness. 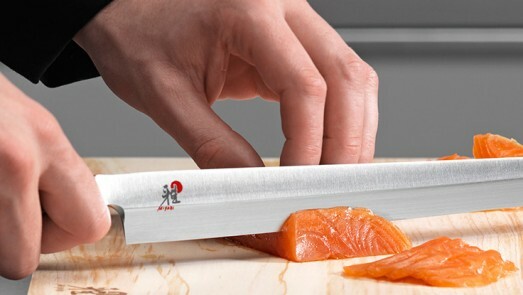 BLADES HONED ON ONE SIDE RESULT FROM THE DEMANDS OF JAPANESE CULINARY CULTURE. There are essentially two different types of Japanese knives: one-sided honed knives, with an asymmetrical blade, and knives honed on both sides with a symmetrical blade. 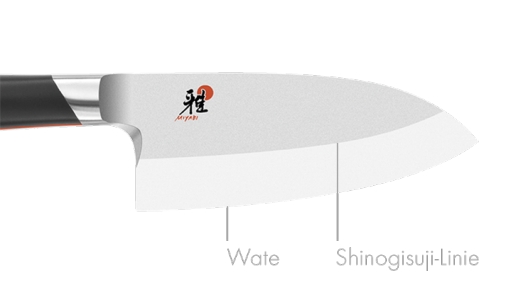 Asymmetrical blade designs, in particular, permit the cutting techniques essential in Japanese cuisine. A knife with an asymmetrical blade is distinguished by the Shinogisuji line that tapers towards the cutting edge. This produces an extremely sharp blade profile, which cuts precisely, finely and smoothly, typical for this type of knives. ALWAYS USE THE MOST SUITABLE KNIFE IN THE PREPARATION OF FOOD. Never use the knives to cut hard food, like shellfish or frozen food. When cutting, avoid bending the knives, as this could damage the sensitive cutting edges. Different types of knife and their uses. As well as the blade profile and honing, the type of steel helps to determine the sharpness of a knife and how long it remains sharp. 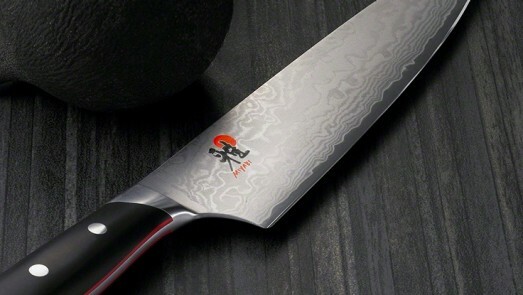 Three different types of steel are used in the production of MIYABI knives. Learn more about the different steels used by MIYABI below. For users who have some experience with Japanese knives. 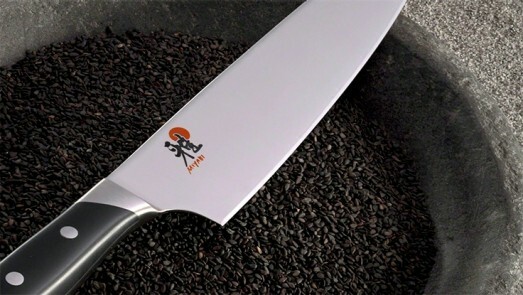 The steel of choice for people who wish to gain their first experience with Japanese knives. The full potential of the knife steel is revealed through a special thermal treatment. This determines the knife's hardness, sharpness, durability and corrosion resistance. The combination of the very best thermal treatment and excellent steel guarantees ideal knife properties. Learn more about the MIYABI steel hardening processes below. FOR THE VERY BEST CUTTING PERFORMANCE TEAMED WITH HIGHEST CORROSION RESISTANCE AND BLADE FLEXIBILITY. First the steel is heated. The blade is then quenched momentarily to room temperature, and is then frozen and hardened at -196 °C. This process improves corrosion resistance. The blade regains flexibility by being re-heated (tempering). FOR EXCEPTIONAL HARDNESS AND EXCELLENT CORROSION RESISTANCE. First the steel is heated. The blade is then cooled to achieve optimum hardness and elasticity. 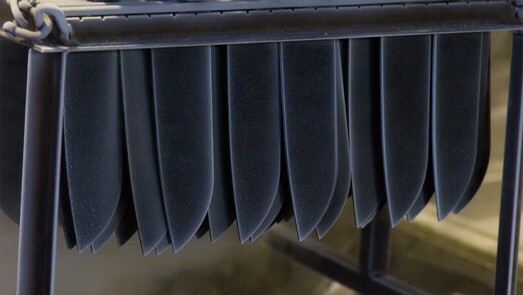 During ice-hardening, the blade is frozen to -70 °C. This leads in turn to good corrosion resistance. 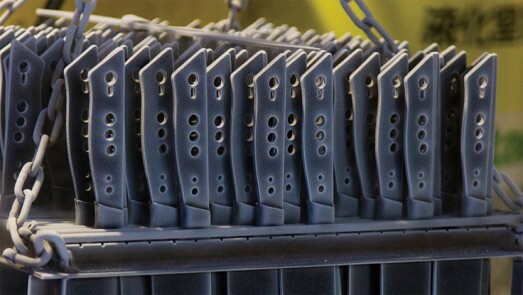 Final heating (tempering) of the blade improves its flexibility, ensuring that it can be used safely and preventing it from fracturing.